I was strolling through my local Rite-Aid the other day to pick up a few bags of cough drops for my hub! Apparently he thinks cough drops are his cure-all! Well, I don't know about that, but I was happy to humor him and even happier when I realized that Rite-Aid carries a huge assortment of my absolute favorite Valentine's candy!!! 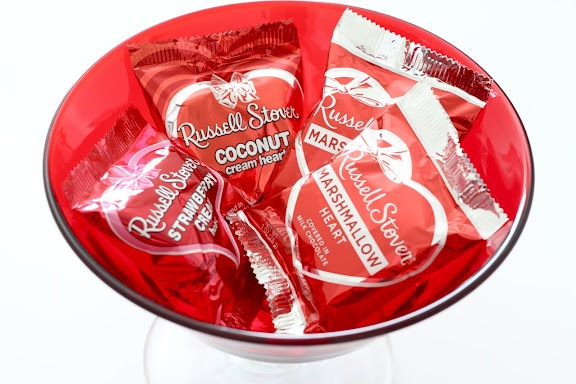 Russell Stover Chocolate Hearts!!! The marshmallow, the coconut cream, the strawberry cream, ahhhh! Amazing! Bri and I are so in sync because she happened to pick a few up at her local market too and they just happen to be one of her favorites as well! I think we get it from our Mom! Our Momma is a Russell Stover chocolate/mallow lover through and through! There is nothing fancy or pretentious about this candy! Just down home and delicious! So don't go and spend a fortune on Belgium Chocolate for your honey this year! Go with these little sweeties! You will not be sorry! And if you haven't tried them, then you are missing out and most definitely need to put them on your "to eat" list! Those look good! I'll have to try them!